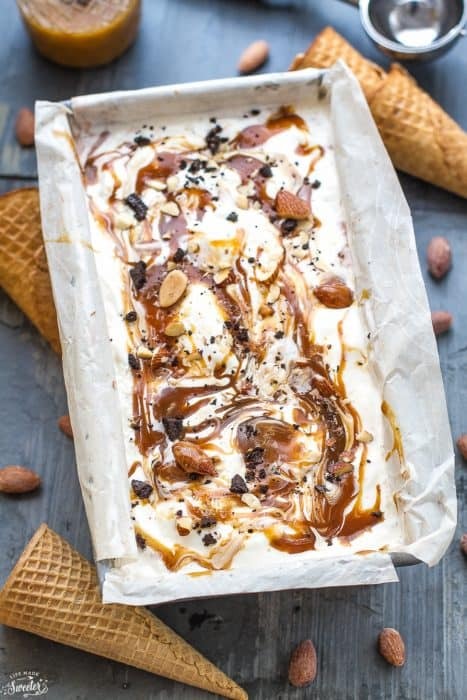 No Churn Salted Caramel Oreo Ice Cream with Almonds is the perfect easy frozen treat for summer! Best of all, only 6-ingredients and no ice cream maker required! There’s nothing better than a cool frozen treat on a hot summer day. So rich, creamy and ridiculously easy to whip up. Best of all – NO ice cream maker is needed for this recipe. Just whip up some heavy cream, mix in the remaining ingredients, swirl in your favorite salted caramel sauce, top with more salted almonds and crushed Oreo cookies and freeze. 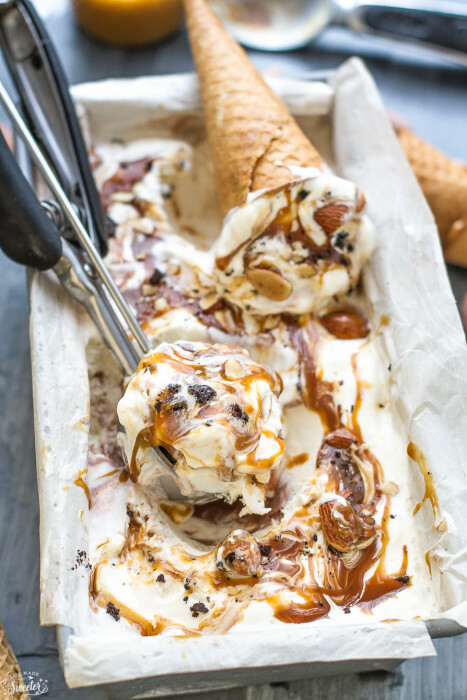 This No Churn Salted Caramel Oreo Ice Cream with Almonds is our newest favorite! The combination of salty and sweet with the creamy, chocolatey Oreo cookies is a match made in heaven! I am usually a plain-Jane Vanilla girl but I was pretty much blown away after one spoonful. Seriously the best ice cream ever! Rich, decadent, creamy and totally indulgent! 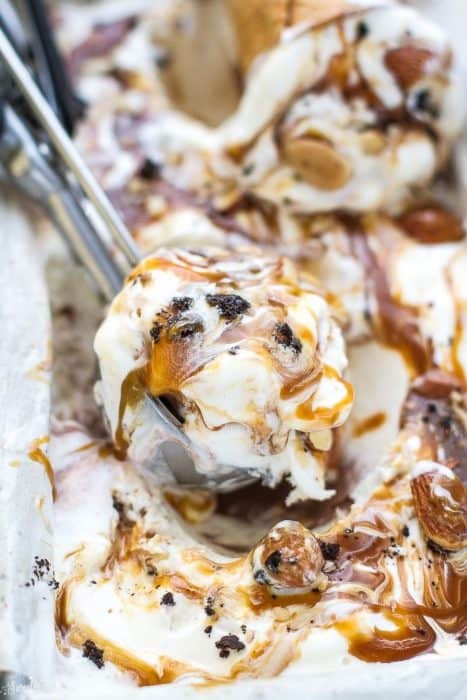 Smooth vanilla ice cream with ribbons of salted caramel and chunks of Oreo cookies and salted caramel almonds. So rich, creamy and decadent. Line a bread/loaf pan with parchment paper or in a freezer safe container. Set aside. In a stand mixer or using your hand mixer, whip heavy whipping cream on high until stiff peaks form. In a medium bowl, whisk together the condensed milk and vanilla extract. Gently fold whipped cream into mixture. Stir in chopped Oreo cookies and almonds, setting aside a handful for topping. Scoop a third of the ice cream mixture into the prepared loaf pan. Drizzle spoonfuls (2 tablespoons or more) of salted caramel over the ice cream and swirl using a butter knife. Scoop another third of the ice cream mixture into the loaf pan. Pour a few more spoonfuls of salted caramel over the ice cream layer and swirl. Scoop remaining ice cream mixture into the loaf pan. Smooth with a spatula. Drizzle with remaining salted caramel sauce and swirl again. Sprinkle with additional Oreo cookie crumbs and salted almonds. *If using Cool Whip, leave out at room temperature until soft and whisk until smooth. Then whisk in with condensed milk and vanilla. Freeze for at least 6 hours. Oh Kelly! You have found my weakness. Salted caramel ice cream – I just really can’t get enough of the stuff. I love that you have put some Oreos in them too. So creamy and smooth that I can’t believe it’s no churn required. Well done, Kelly. I’m drooling over this ice cream, Kelly! This looks absolutely amazing! What a fantastic way to use salted caramel almonds, which are my favorite! I love the addition of oreos in this ice cream, too. What a perfect summer treat! I can’t resist ice cream with salted caramel! Can’t wait to try this! No churn ice-cream recipes are the best! I can’t believe how this only has 6 ingredients, what an incredible recipe Kelly! It looks amazing. Salted caramel flavours are so perfect for ice cream and I love the oreo addition! Pass me a big scoop! This ice cream is dreamy, Kelly. All that caramel-y goodness with almonds in a no churn ice cream. I doesn’t get much better! I find any excuse to eat ice cream, especially in the summer. This recipe looks incredible, Kelly! I love all of the sweet fillings and that caramel sauce is calling my name! I really need to try no-churn ice cream, and this recipe looks amazing. Thanks for sharing! THIS LOOKS AMAZING! Ice cream is my absolute favorite and I love that this is no churn – makes it so easy to make your own ice cream! My mouth is watering Kelly! Oh boy, I love an ice cream with almonds! We used to get the Haagen Dazs vanilla swiss almond and I’d plow through a container always looking for just one more almond…This can be very dangerous! : ) It’s funny how we tend to go for familiar favorites when it comes to going for ice cream but it’s so fun to make and eat something special like this! Kelly, I LOVE this ice cream!!!! Wow!!! and can’t wait to try the Blue Diamond Salted Caramel Almonds!!! omg, I love this ice cream Kelly! So good, all that salted caramel goodness is making me drool!! Oh yes, yes and YES! This is ALL my favourite things wrapped up in one tasty package! I love it Kelly! I don’t know what think tank the fine people at Blue Diamond are using but these nuts they are bringing out are amazing! And adding them to caramel and oreos? With no churn ice cream? I totally support this 100%! OMG! This ice cream looks SO drool-worthy, Kelly! I’m so in love with Blue Diamond Almonds. Such a creative way to use’em! This looks incredible! It looks just as delicious the ice cream stand without the ice cream stand price. Pinning. Oh my GOSH. All that swirl-y caramel goodness with those gorgeous almonds is literally killing me! I just can’t even…Kelly, this ice cream is pretty much just amazing. And whoa, girl your photos are absolute stunners! 😉 Pinned! Totally need this in life – the swirly caramely goodness…and no churn ice cream? Sold! I’ve seen a few recipes using these two almonds recently and OMG I need them. Preferably in salted caramel oreo ice cream form. Oh my gosh, Kelly, could ice cream get any better? My jaw drops every single time I visit your site. 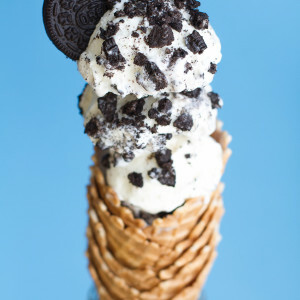 This ice cream is so perfect, with the simple creamy base but crunch of oreos and almonds. This would be my dessert of choice any day of the week! Kelly, I still love going to state fairs for that funnel cake scented air 🙂 What a fun memory for your boy! This ice cream looks out of this world–so many good things going on in it! When I first read the title of “no-churn” I was like HOWWW!! I need to know this easy and perfect recipe. I love how simple this is! We are huge ice cream eaters and I know my husband will love it! Thanks Kait! Even though we have an ice cream maker, no churn ice cream is my new favorite since it’s so easy. Hope you get to try it out 🙂 We are big ice cream eaters too! Almonds, salted caramel, oreos AND no ice cream maker… I am SOLD! Kelly this looks incredible! Kids are so funny – my daughter was the same exact way a few years ago. Despite all the wonderful ice cream flavors out there, she’d always choose vanilla. Now my 5-year old has finally branched out into other flavors. Love that this is no-churn! Haha yay, so glad she’s open to trying different flavors now 🙂 Thanks Eva! Cannot get over how amazing this looks. Drool-worthy! 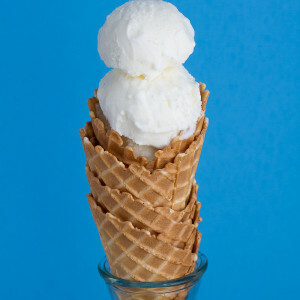 I love vanilla ice cream, but not plain — it’s the perfect blank canvas for whatever you’re in the mood to add to it! I love what you added here, being that I’m a huge fan of salty-sweet. This is my kind of ice cream! GAHHHHHHHH!!!!!!!!!!!! I wanna face plant into this right this very instant! 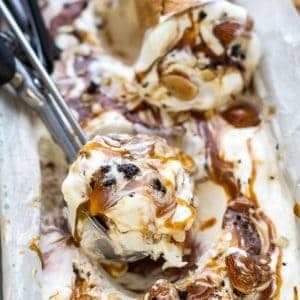 I love the sweet and salty combo too and Kelly – you have made such good use of Blue Diamond’s Salted Caramel Almonds in this ice cream! 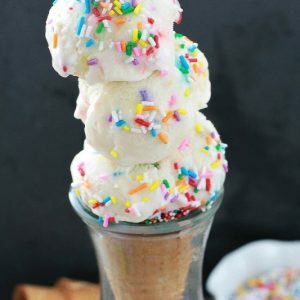 I am obsessed with all the no churn ice cream recipes this summer (clearly, lol)! Salted caramel is pretty much the best thing ever — I definitely need to get my hands on some of those almonds! This ice cream looks amazing! I love the saltiness that the salted caramel adds, definitely makes you want to go back in for more and more! Okay, just the name of this got me drooling and then I saw the pictures! This Ice cream sounds and looks so decadent and I love that it’s no churn too. I just love the idea of combining the caramel, oreos and almonds! Oh my goodness this ice cream looks amazing Kelly! LOVE that it is no churn! I love this, I made something similar, just with chocolate cones next time I am adding almonds! KELLY! This ice cream is amazing! All the best flavors! Aaw thanks so much, Natalie! Hope you are feeling well 🙂 Have a wonderful weekend! Nommm… I would like some ice cream right about now. The salted caramel, oreo and almonds sound awesome together! Awh! I love the story of your son choosing the vanilla – I knew you were going to say that! Sounds just like my hubby! I would not be able to resist your no-churn! This is as perfect an ice cream as they come, in my book! Love it, Kelly! Aaw, thank so much for reading Annie! So glad you liked it 🙂 Happy Friday! Hope you have a wonderful weekend! Same here, no churns are great for those days I forget to freeze the container overnight 🙂 Thanks Emma! Oh my goodness this looks so good! Will definitely be making this when the weather warms up again! Hope the weather warms up for you soon 🙂 Thanks for stopping by, Lauren! Happy Friday! This looks totally insane … in the best possible way! I’m drooling over al that caramel. Yum! Wow, this ice cream looks so scrumptious! That caramel is mouth-watering! This looks delicious, as do all of your recipes!! Really love your photography, too. This looks delicious. I would definitely try it! Thanks a lot! Wow! Everything about this sounds amazing! Love all these flavors and that it’s no churn!